It sure feels like it with all the warm weather! I got out for a few minutes on Tuesday with Pete before he had to move out. We stopped at the Old Durham Reservoir since we had less than an hour to fish. Unfortunately, the fish did not cooperate at all. I just managed one bite in the time we spent there and we didn't spot any in the shallows like we usually do. We were about to switch spots but Pete got a call and we had to head back to the dorm to move out. After helping him move out, I had about an hour before my next commitment so I went out to the trout stream we originally planned to hit. Within my first 5 casts, I managed a small brookie, which got me excited. Next cast, a creek chub, not what I'm looking for but not terrible either. The rest of the day was a complete blank which was very puzzling. Upstream, I ran into a father and daughter duo who said they got a few bites and hooked a few fish under a bridge. They also said that there was a derby this past weekend, which may or may not explain why the place was cleaned out? After talking to them for a few more minutes, I found out that the daughter was also a college student (at a different school) who had just finished finals that day! Of course, we spent the next few minutes chatting about how "terrible" finals week is before heading off our separate ways. After moving out yesterday, I hit the Nissitissit River in Mass. since I heard that they had recently put some browns in there and I had yet to catch one this spring. I also hoped to try for a trifecta since all 3 species had been put in recently and I have yet to catch all 3 species in a single day of fishing. Well 2/3 isn't bad at all. I got into 3 browns, 1 bow, and 2 chubs, going 4/5 in the trout department. All fish except for one chub came on a large cased caddis soft hackle dead drifted under an indicator. Unfortunately, it was more a day of fish stories rather than proof since these fish were less than cooperative for the camera. Still at large: 16 in. bow that "stole" a soft hackle as I tried to land it. I did snap a decent photo that really shows unusual brookie-like striations on the back of one of the browns. Apparently, this has been pretty common in Massachusetts brown trout this year since I've heard reports of brookie-like brown trout from the Cape ponds (not tiger trout, my buddy verified with the DFW). 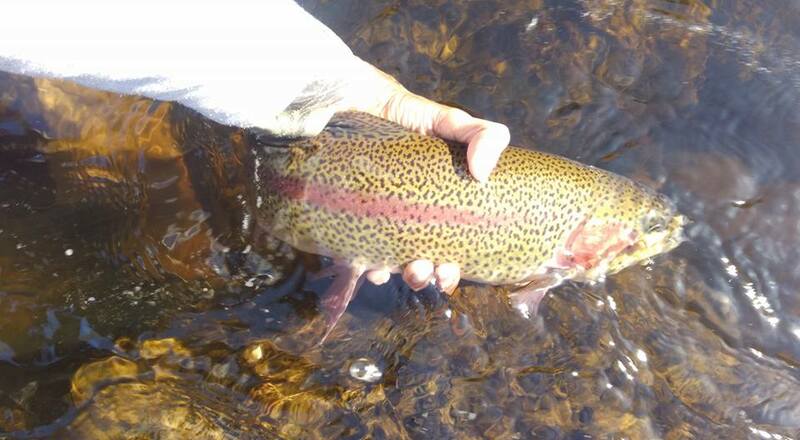 On another note, I met a fly fisherman on the way out who reported catching one nice bow nymphing. It was nice to meet you Carl! The DFW has really put in some great fish this year and they have spread out very well and are absolute fighters! Get out there before the bait boys and herons do!